Just a marker to say post yours here. Hope to get some pics and views up myself over the next day or so. Sheena Vernons second year at bloom brought an interactive show garden exploring Ireland's rich heritage of fairy folklore. Set in a fairy glade, visitors could walk through a woodland scene where old stone walls, a well, a cave and fallen trees provide habitats for the tree spirits. Invited to look up into the branches of an ancient yew, this was a chance for the young and the young at heart to awaken to the magic that lies hidden in every garden. Laurence Colleran and the South Dublin Co. Co. Education Society brought us "The Blooming Good Fun School Garden"
This garden was designed to be a fun educational space which is accessible to those with disabilities and particularly stimulating to children with learning difficulties. There were items which served as educational aids particularly focusing on wildlife and the environment. 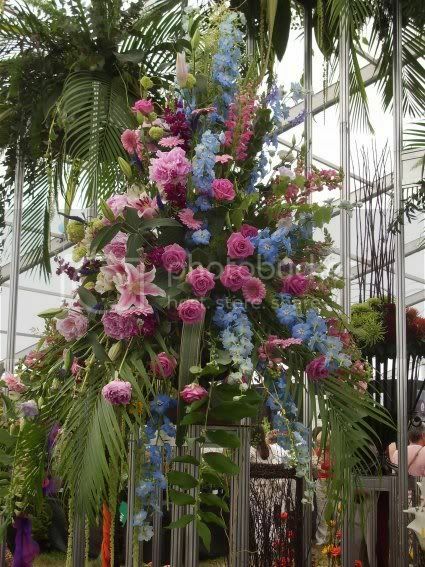 The theme was a garden of the senses. As you walked through the garden you passed through 5 themed spaces each representing one of the senses- Sight, Sound, Touch, Scent and Taste. These were also represented on the garden boundary. In each of the spaces the features and plants relate to that sense. The sight zone features colourful plants, mirrors, a blackboard and an insect hotel. The sound zone has an archway with wind chimes, homemade instruments and grasses and bamboos for their rustling sound. 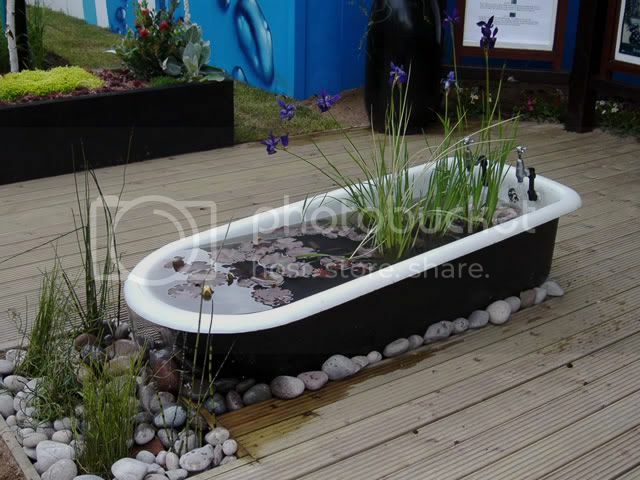 The touch zone featured tactile plants, a wormery and a raised water feature, the bath shown in the picture. 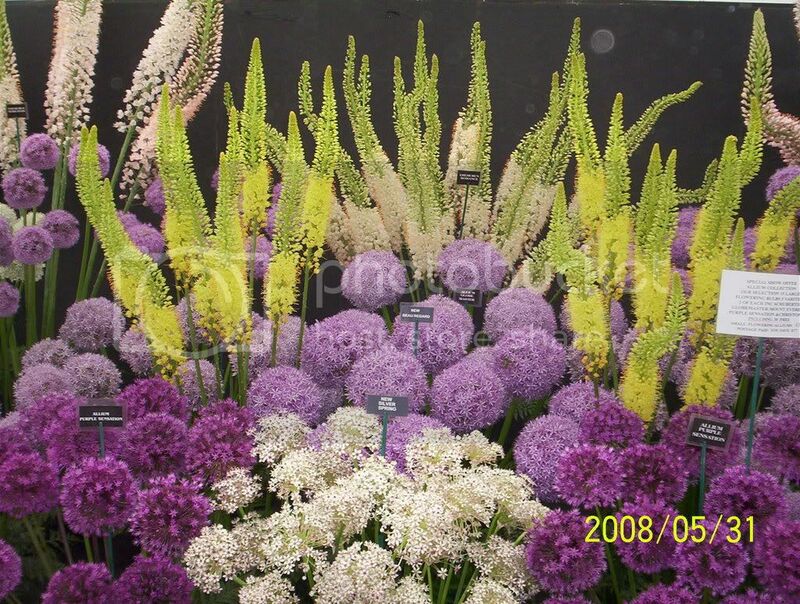 The scented area had scented plants and herbs and a camomile lawn. Whereas the taste area featured fruit and vegetables. 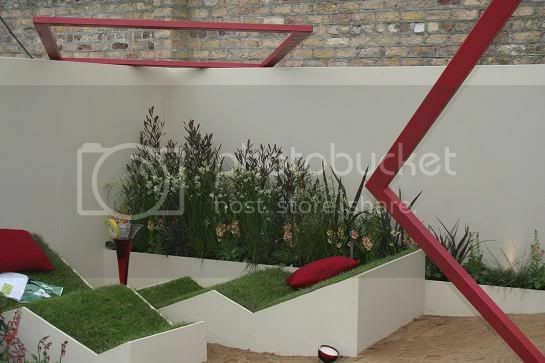 SinÃ©ad Finn brought a garden called "The Spaces Between" to her second year at bloom. 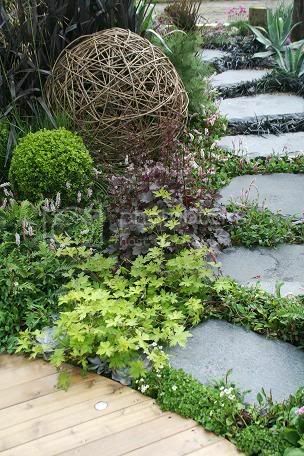 The garden explored the relationship between different surfaces and how the combination of varying textures can create a tranquil space. The area was divided up into a series of strips or spaces, each of which was composed of different materials and textures. Taken as a whole, the strips contrasted each other. This contrast served to emphasize the individual nature of each strip, creating a visually complex and inviting scape. 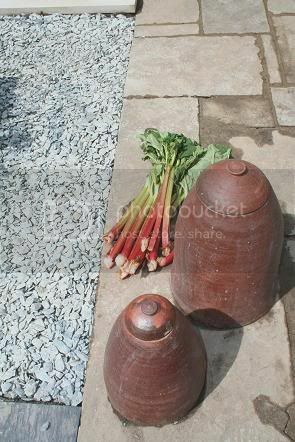 There was a range of hard landscaping materials in the garden. 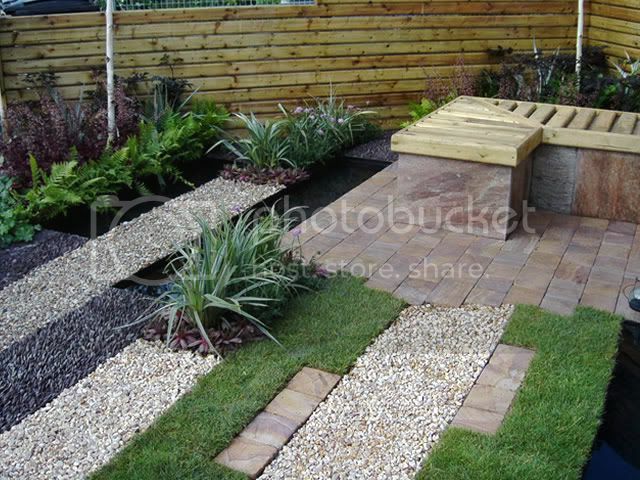 These included cobbles, pebbles, slate and gravel. 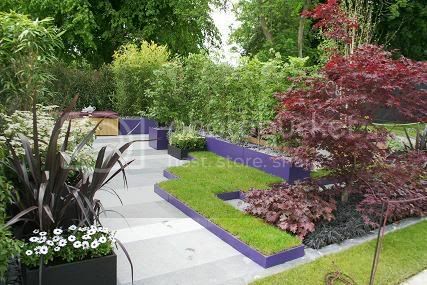 These were used to highlight the different effects they bring to a garden design and also how planting can be accentuated and complemented by using different surface materials. 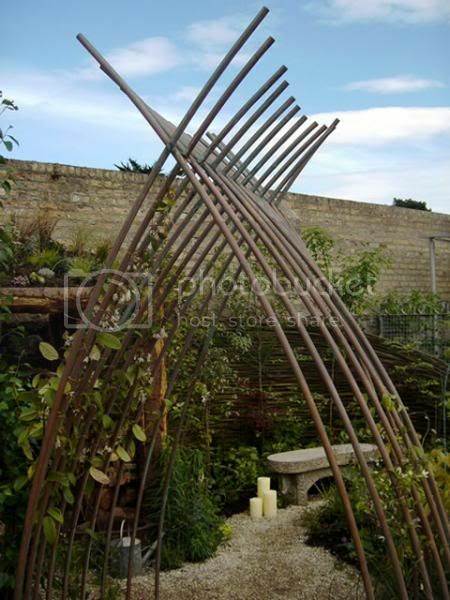 There were also three rills in the garden, these were included to bring another texture to the space and for the light reflecting qualities of water. Leonie Meehan exibited the garden entitled "Taking the Right "Course" Learning from Nature"
Intended to highlight the theme of education and its importance in the world today. It looked at how we can learn from nature, by displaying the Gingko tree as the main specimen plant. The Gingko is a living fossil that can be traced back over 200 million years. Around the Gingko was a metal sculpture built from the remnants of our vandal destroyed green house. The aluminium spines were intended to depict chaos now adorned with climbing plants. The stoney area underneath was planted with low ground cover and rock species continuing the story of natures triumph over evil. Lurene Tallons garden was "What a wonderful world we live in!" 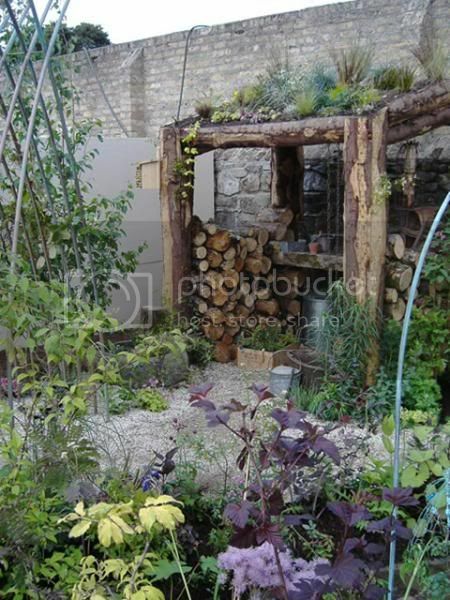 The garden is created with a log cabin/potting shed with a sedum and grass roof. This structure is designed to become home to invertebrates like ladybirds and lacewings who will overwinter there. 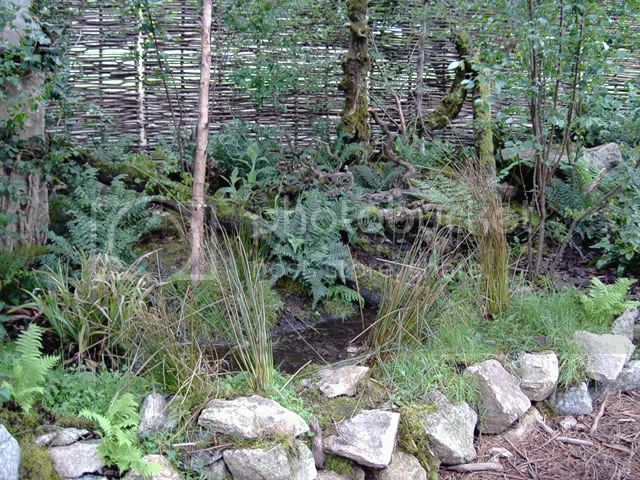 The gardens wildlife pond should attract amphibians, invertebrates, visiting mammals and birds. 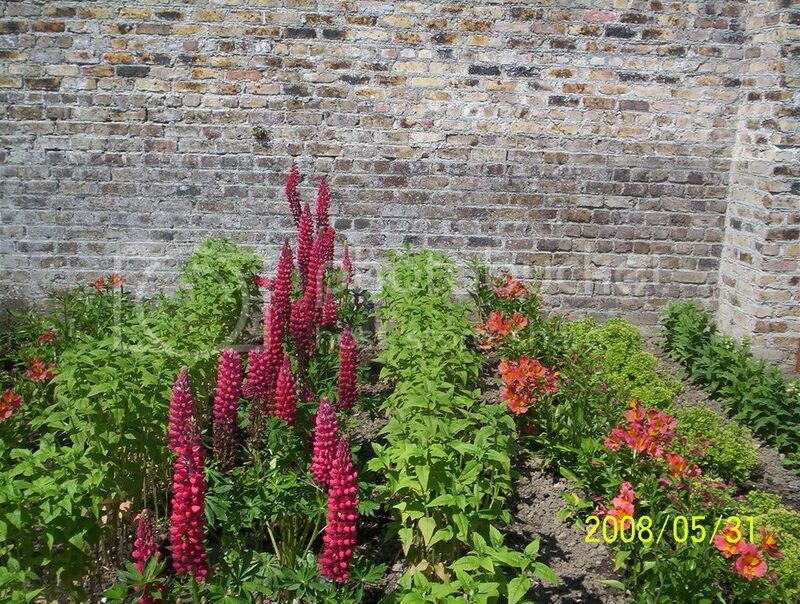 Whilst the planting will sustain the visitors and residents of the garden alike. The purpose of this garden was to create a habitat that works with nature...a space that is full of life and promise. 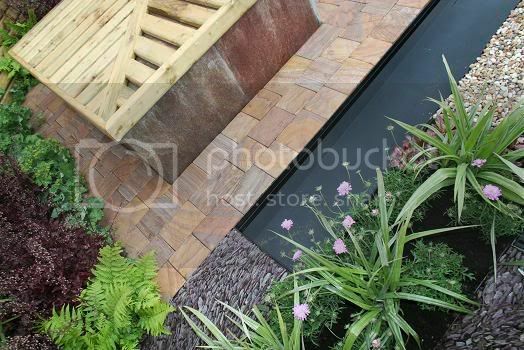 This garden was made from recycled/reclaimed materials and the appropriate planting, enticing you to want to go out there and get your hands dirty. Gerard Mullens garden for this years bloom show was "Sandscape"
Sandscape explored modern living in a dramatic coastal location. The garden incorporated a private terraced space and direct access through rolling sand dunes to a beach. The design contrasted contemporary form and structure with natural materials, placing emphasis on establishing harmony with the immediate natural environment. Walls were constructed of rammed earth to provide a substantial solid backdrop to the space adding a sense of shelter and security. 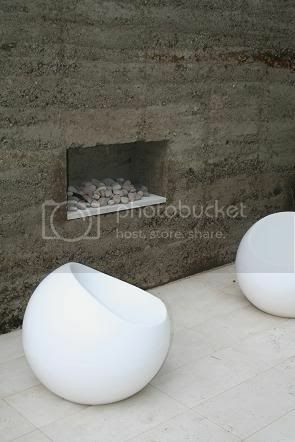 Inclusion of an open fire provided a warm focus for evenings spent snuggled in a cosy chair under the stars. 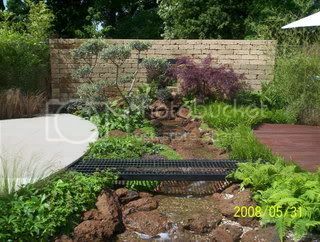 The planting was designed to create an informal soft and romantic space which blends with the surrounding landscape and provides a visual extension of the garden boundaries. Due to the geographical nature of the site, with free draining sandy soils, the garden utilised a drought tolerant planting scheme incorporating local species to help seamlessly transition the garden as it filters out into the wild sand dunes beyond. 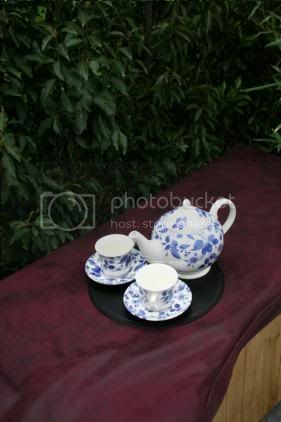 Frazer McDonogh had this years Lyons Tea Garden "Green Retreat"
It was an intimate garden to relax and unwind from the outside world, with a sub tropical atmosphere of lush leafy plants. 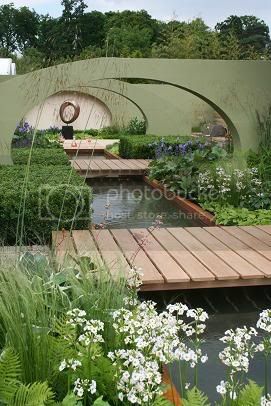 Circular timber decks lead you into the garden in a stepping stone effect, rising and falling towards a seating area that was partially surrounded by water on one side and dense planting on the other. 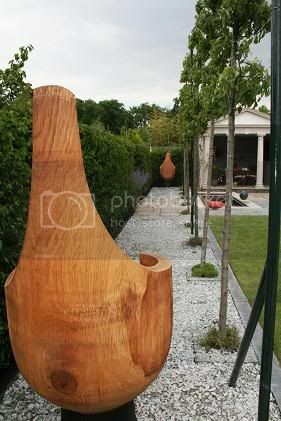 Three large clay urns punctuated the walkway and gave definition. 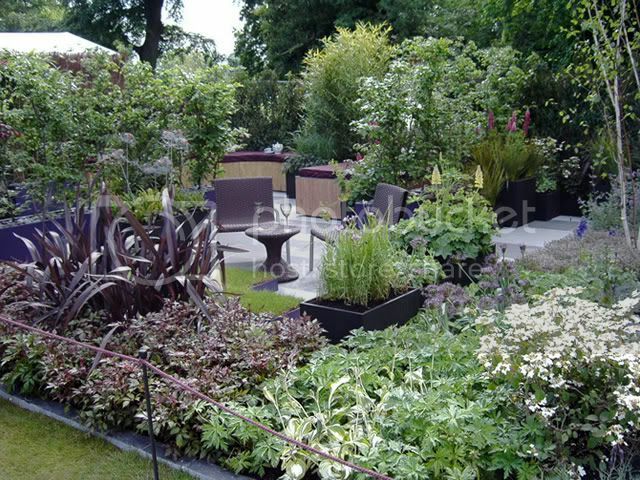 The green retreat was based around the use of plants with bold, dramatic foliage. The range of colours, shapes and textures veered the feathery leaves of the Dicksonia tree ferns that are under planted with waves of ground ferns and Hostas, to the large fan shaped foliage of the Trachycarpus Fortunei. 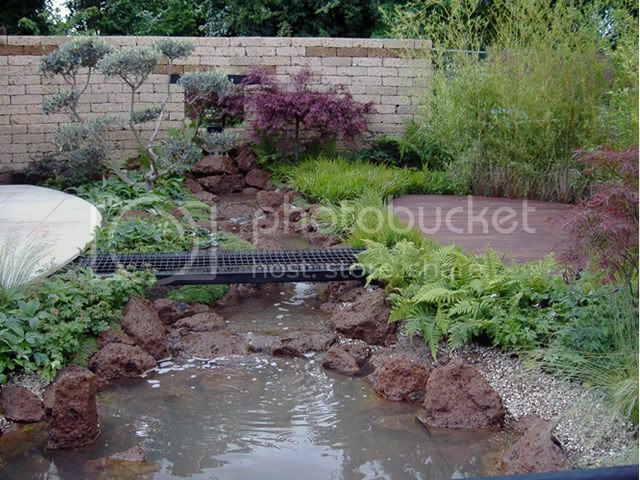 A natural water feature with a small waterfall was added to give movement, sound and reflection of the surrounding plants and the sky above. A small area of the pond wass planted with aquatics like Iris and reeds which broke the division between the decks. Willow fencing was used for the boundaries to give a natural backdrop and a contrasting colour that highlights the plants. "How does your Garden go?" 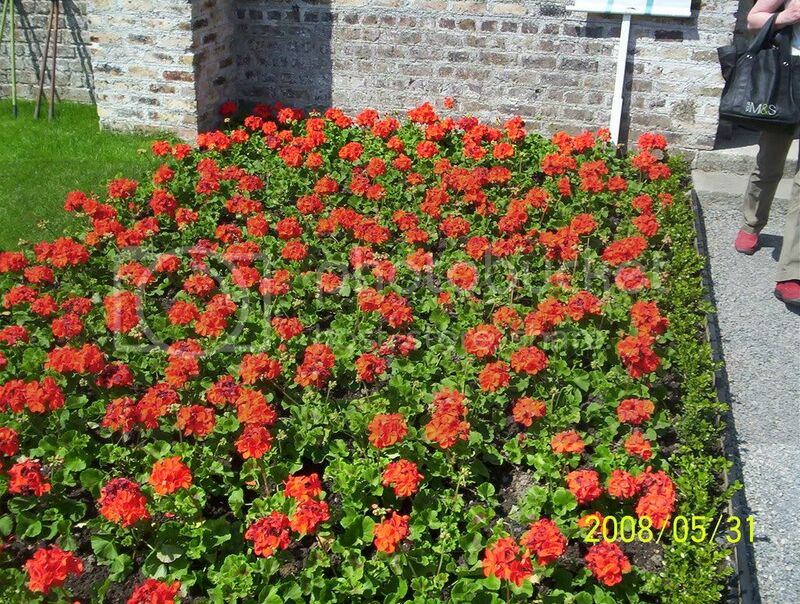 was the query posed in Maximilian Kempers bloom garden. 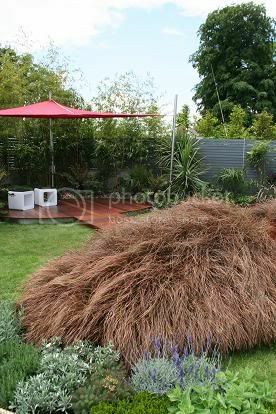 It was a conceptional approach to a contemporary outdoor space which did not want to be defined by a single purpose or use but which can be easily changed, re-arranged and re-designed to serve a multitude of possible occasions/ uses. 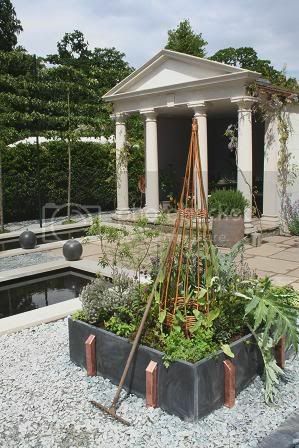 All the garden features (apart from the boundaries) in this design were movable and planted or placed into rectangular planters of different sizes and heights which bear four casters underneath in order to be moved easily. Out of the numberless layout possiblities, Maximilian dispayed four different variations in two hour rotations -on the hour- and offered the visitors a different garden experience each time they passed by. There was a Breakfast Garden, a Dinner Lounge, Leisure and Play Garden and a Party Room. In each case the garden changed in front of the visitors' eyes and within five minutes a very different outdoor space was be presented. 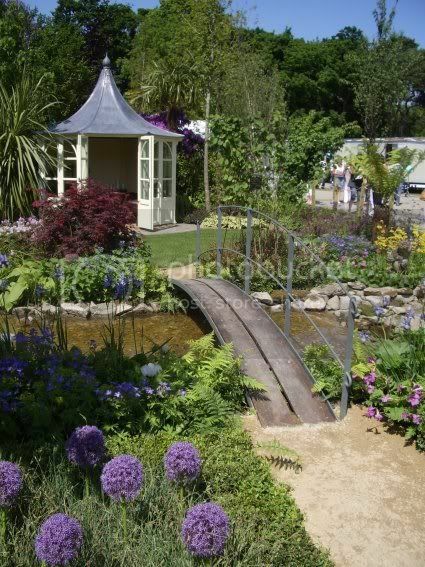 Jane McCorkell returned after her Gold Medal at the Bloom 07 Garden Show with a garden entitled "The Orchard Path"
The Orchard Path was a fruitful passage through a reclaimed section of a large mature garden. 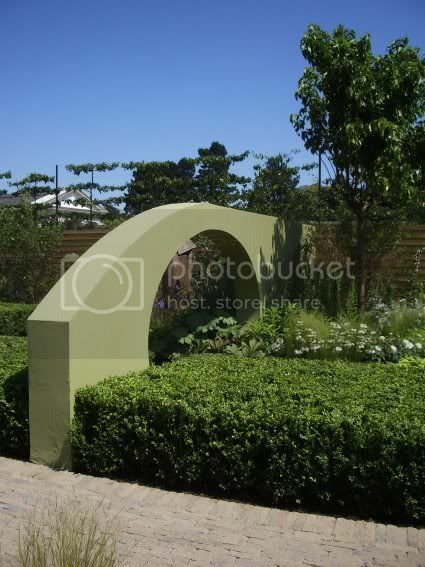 The garden traveller could stroll through or past a variety of fruit trees, along a gentle cobble walkway. They could experience various elements of interest along the way, such as jumping water, herbs, and softly planted herbaceous sweeps. A sense of movement was present, along with a sense of mystery and anticipation. Transitional spaces were created to allow for private relaxation, and social interaction for the various age groups that could enjoy such a journey. 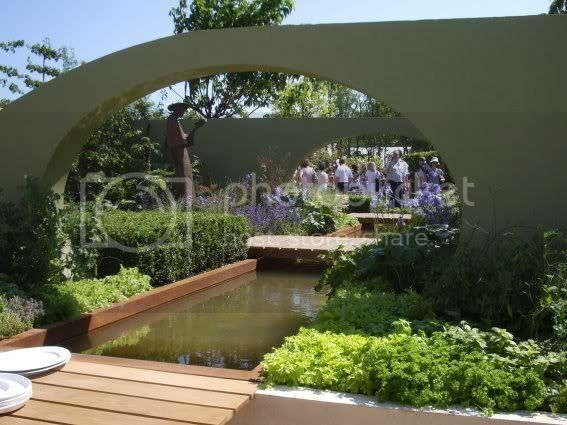 Peter Donegan won silver at bloom 2007 for his large garden design 'No rubber-soul', this year he was back with "Pour L'amour de Jeux". And he was indeed doing it for the love of the game as the title suggested he told me. The pink or were they purple ties sported by Peter and his team certainly suggested that. 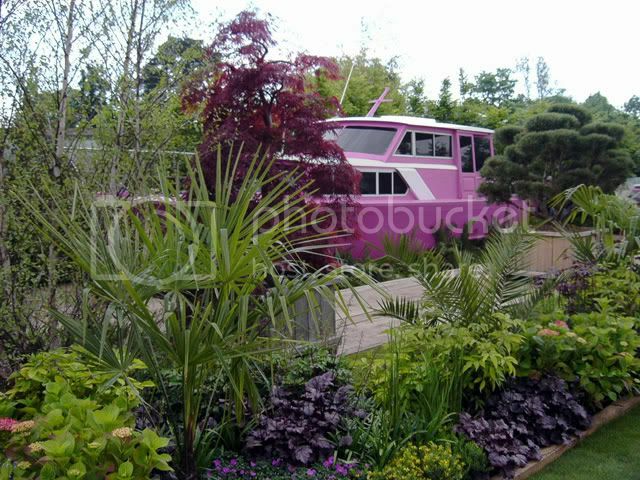 It was a garden fully recycled or recyclable, the main feature comprising a 1957, pink, three story pleasure cruise boat named 'CaitlÃ­n, Mo ChailÃ­n. 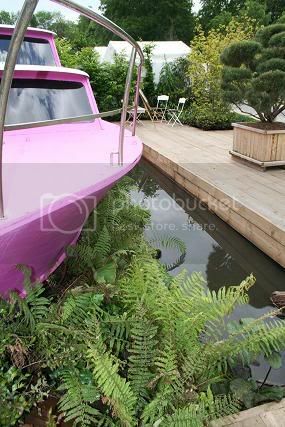 The garden was surrounded by water, a slightly raised recycled timber and lawn combined marina, and natures finest planting. The finishing touch was a hand sculpted piece by Patrick Campbell. Paul Doyle brought us the Travel Departments Garden: "Wherever the wind takes me I travel..."
This was garden of great elegance which derives its roots of inspiration from the classical gardens of Italy. It was conceived as a formal mulberry grove that blends texture and structure with sublime elegance and ease. 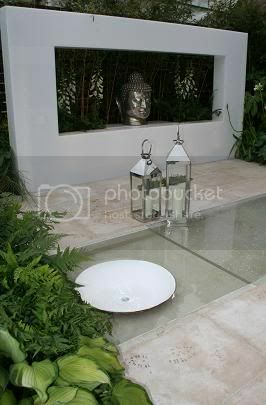 The garden exuded Art Deco elegance through the restrained use of vertical bronze statuary, mirror slivers and richly embellished doors with recessed silver panels displaying Oriental wallpaper. 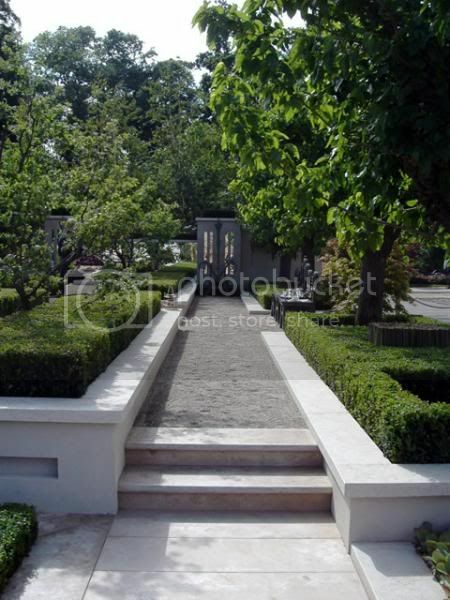 The length of the garden was exaggerated to great effect by sub-dividing the space into linear strips on various levels, culminating dramatically in a wall of mirror. The lines comprised Jura German limestone, Wicklow granite river-bed grit and box hedging on the lower stories, with soft casual mulberry trees above. 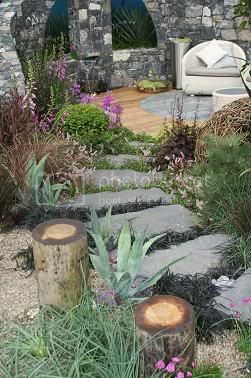 Mark Grehan Garden Design brought the west coast of Ireland to bloom 08 with his garden "Inisoirr"
Mark drew his inspiration for the garden from the Aran island of Inisoirr, Co. Galway. It was a contemporary design which celebrated both modern and traditional values in architecture and design. 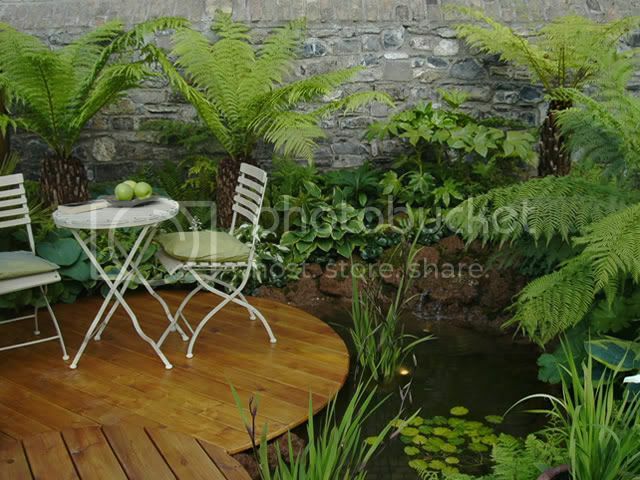 The garden was designed for a client from Inisoirr wishing to bring elements of the island to their suburban back garden. The aim was to create a space in which to relax and entertain, containing coastal elements and references with a modern twist. 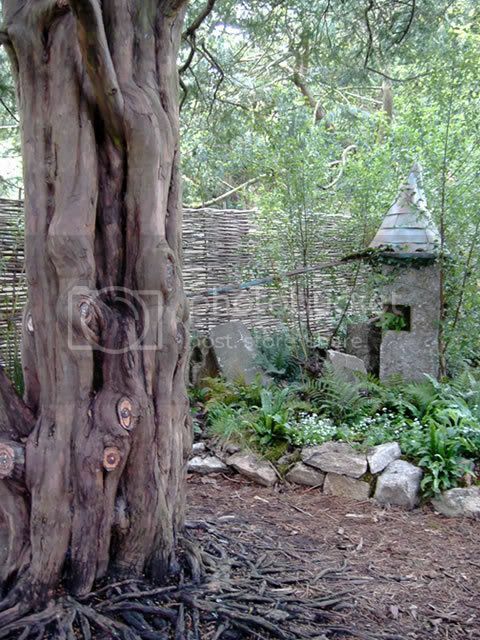 The garden used traditional materials native to Inisoirr, such as limestone and wicker. The plants used were similar to some of the native species found on the island. 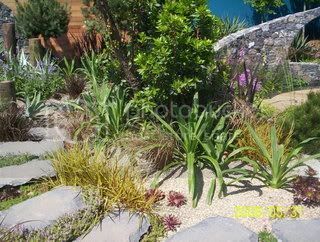 To create structure and inject a modern feel, plants not native to the island but suitable for a coastal site were chosen. 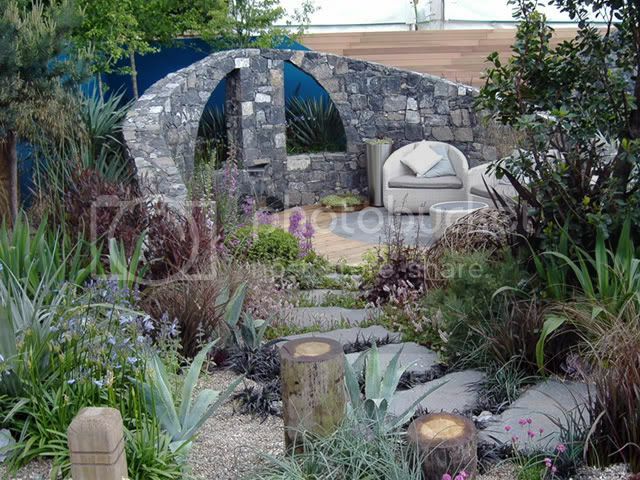 A large spiral wall within the garden created a sheltered area which allowed for the inclusion of plants which may not normally grow in maritime areas. 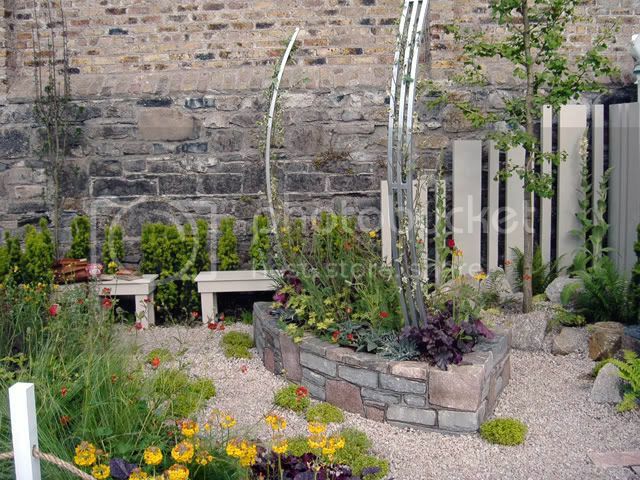 Many of the elements used within the garden helped to convey the maritime theme and also reminded us of Inisoirr. Tobar Einde, a holy well on the island, is a calming place and the gardens dynamic water feature helped recreate this element in the garden. 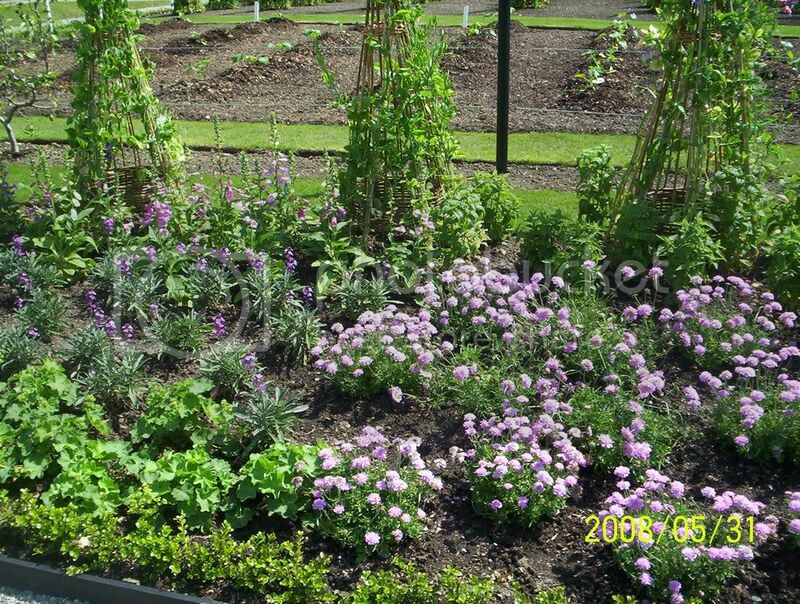 Liat and Oliver Schurmann who run Mount Venus Nursery in Dublin brought their garden entitled "Twilight". 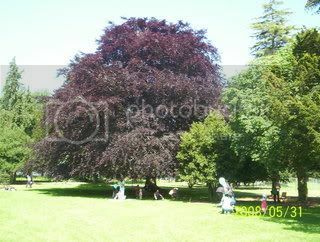 Tall arching deciduous trees and shrubs provided a foliage canopy. A round pond in the centre was linked with water canals, which were woven through the garden imbedded with lush subtle woodland plants such as drifts of fine leafed grasses arching into the water, carpets of shamrock with dainty white flowers, mosses and woodland lilies. 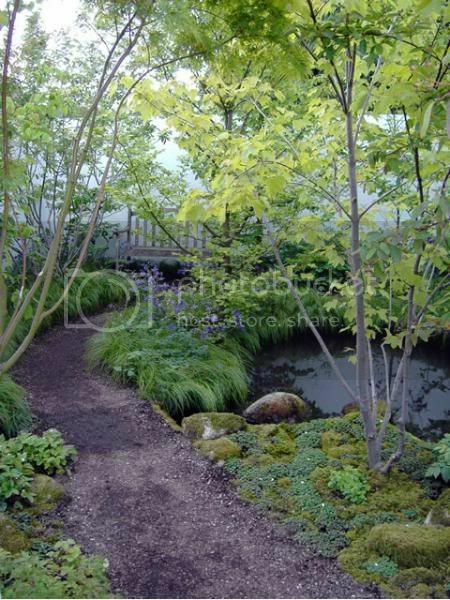 A path wound it's way through the garden linking small seating areas, from which tranquil vistas through the planting and across the water could be enjoyed, abolishing the feeling of being in an enclosed space. It gave the impression that you were in the living room looking though large windows and sliding doors out into the garden. The intention of the garden was to take the garden into the living room. 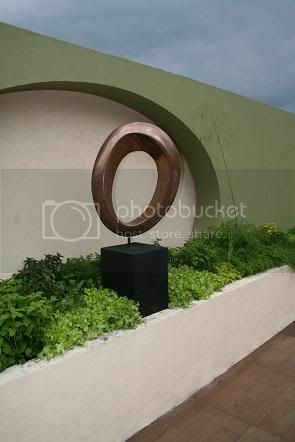 Brian O'Hara exhibited at Bloom 2007 winning a silver medal in the medium size category for his garden "Outspace #1". This year he created Outspace #2 for us. 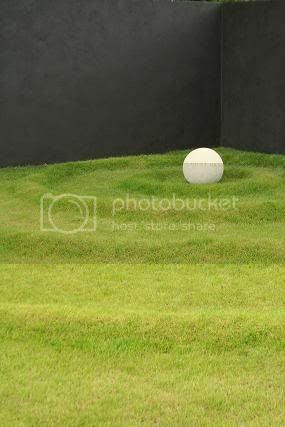 Outspace #2 was an oval garden approx. 8m x 10m in dimension. 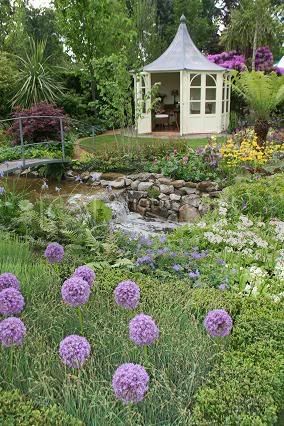 The garden had two sitting areas at opposite ends of the garden framing the main planted area in the middle with a very natural stream flowing across the middle. 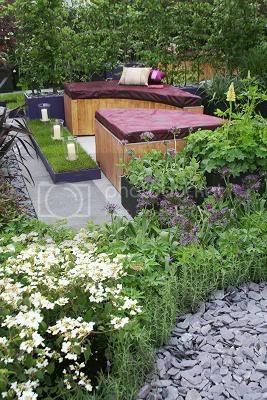 The larger sitting area was paved with granite slabs with inset beds and was raised slightly above the main planted area. The second, smaller sitting area was decked with hardwood and is also raised and surrounded to its rear by a dense curved "wall" of bamboo. 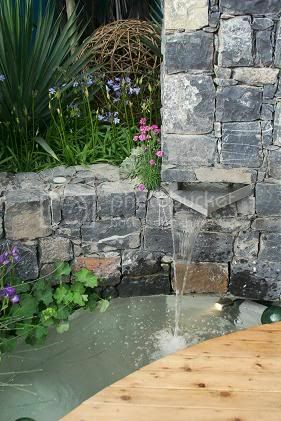 The stream started with a cascade built into a curved wall on one side and flows in twists and turns to a pond on the opposite side. The atmosphere that Brian was trying to achieve is one of polarity between the clean lines and surfaces of the "man-made" areas and the natural space between. 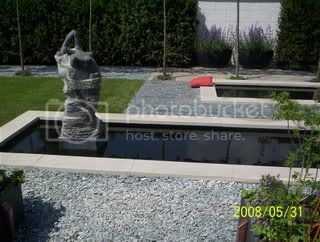 Although the garden design was not very Japanese in nature a similar feeling of serenity seemed to be achieved. Tim Austens garden for bloom 08 was called "Inspiration from Mount Usher"
The purpose of the garden was to celebrate the design and longevity of the Mount Usher gardens and to show how key garden design ideas, such as the naturalistic planting style and plant layering, can be extracted from them and applied to smaller garden spaces. 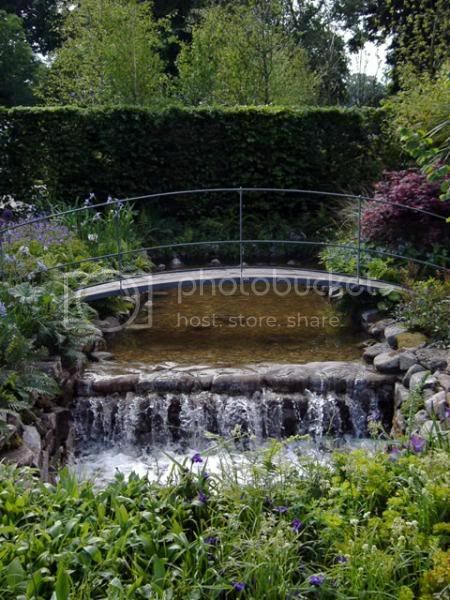 The garden included a water feature with an ornamental bridge that took its design inspiration from the fantastic and well-known 'bouncy' bridge crossing the river Vartry within the Mount Usher gardens. In addition, a formal gazebo was placed in the central part of the garden, set amongst woodland planting, and fringed by a formal lawn; this representative of the house at Mount Usher. The boundaries of the garden were formed by beech hedging, taking a design cue from the formal hedging in the area of the Old Millstone, which is near the main entrance of Mount Usher. 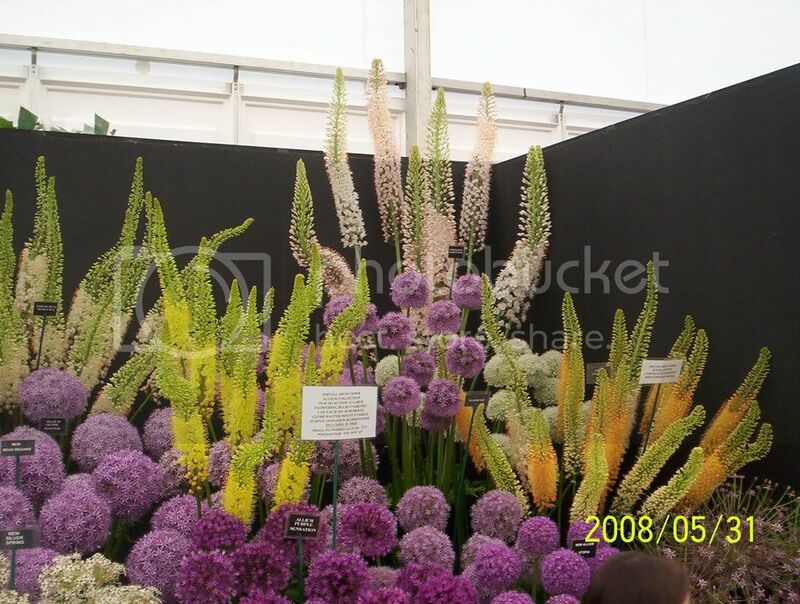 The garden broadly contained three types of planting: herbaceous perennials, bog-garden plants (waterside plants and those tolerant of wet and acidic soil conditions), and naturalistic woodland planting (trees, shrubs and ground cover). 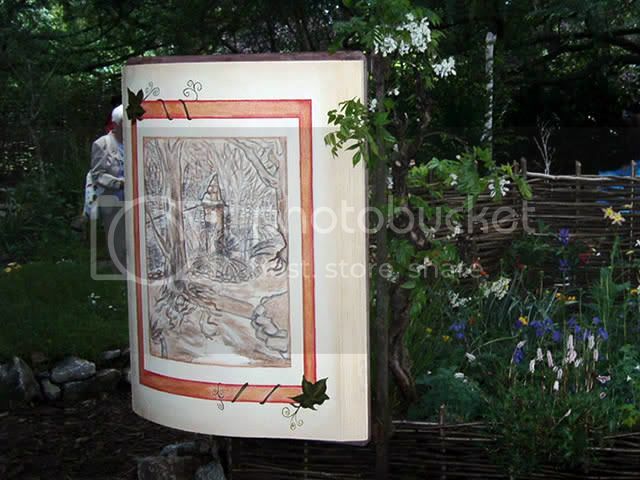 Structural trees and shrubs, both evergreen and deciduous, were also used to create the framework of the garden. 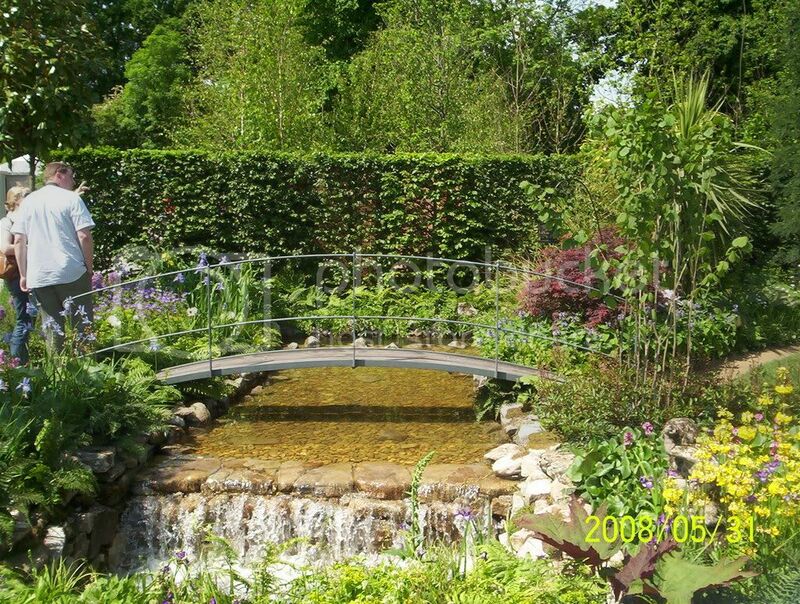 Another few images from Bloom , some of the show garden and the Flower pavilion from Saturday on a beautiful day. 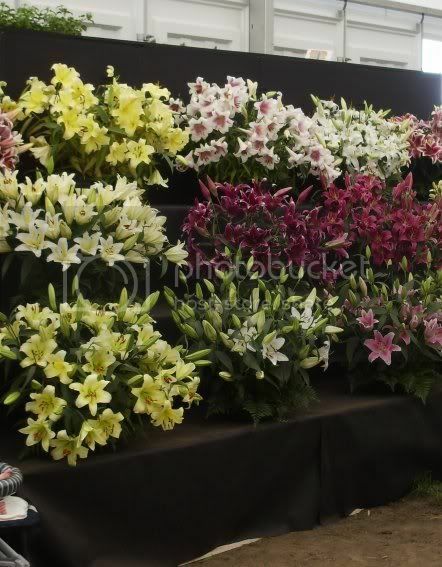 from Paul Martins show garden. Another view from Tim Austens garden. more photos of mine Must say was pleased to discover giant sequoias growing in phoneix park, took the tree walk that was on very enjoyable. Went on sat beautiful day ,lots of people about .Anyone that say one should go for a day is wrong ,want at least 2 days.Liked the gardens will post some of those later on. lovely photos all of you. 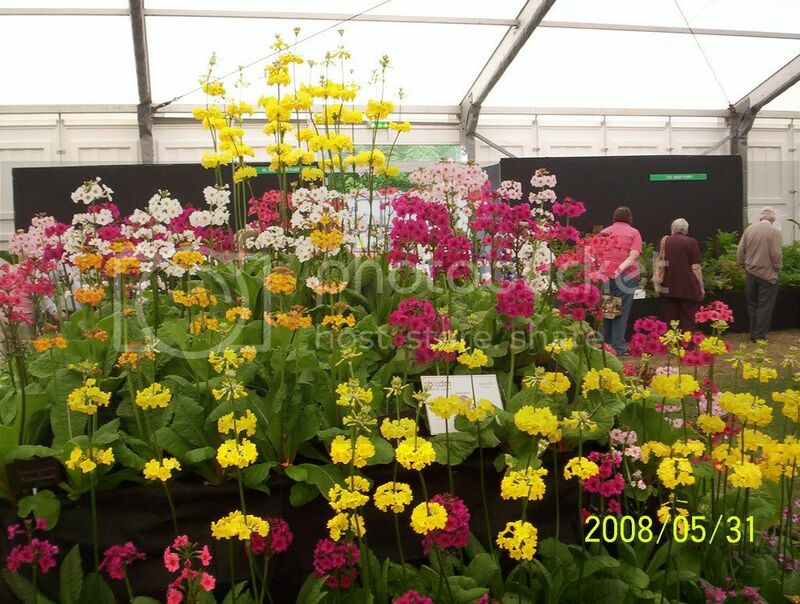 The show gardens looked fab. Must go next year myself. 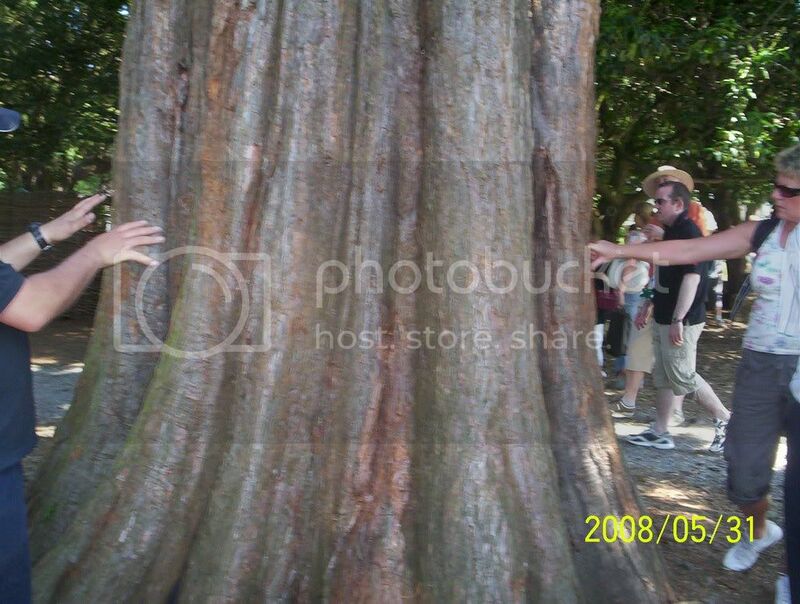 Spider I especially like your one of all the people touching the bark of the tree. 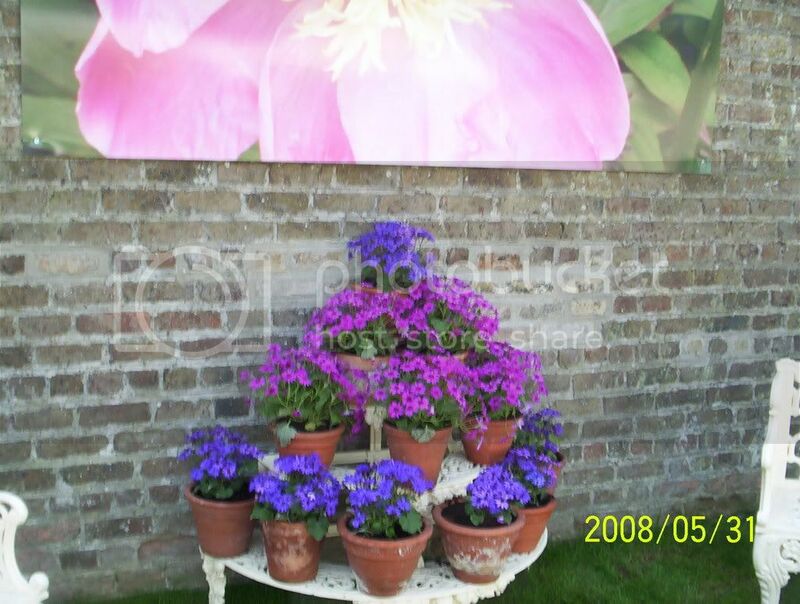 how were the plants faring in the sun? we went on friday, and there was at least one tree already wilting from the heat and lack of water. you can resize them all from within your photobucket a/c. It may mean you have to repost the adjusted image links again. Try one and see how you get on. Also sometimes when you alter the size of a pic and look at it on the forum, it seems unaltered. 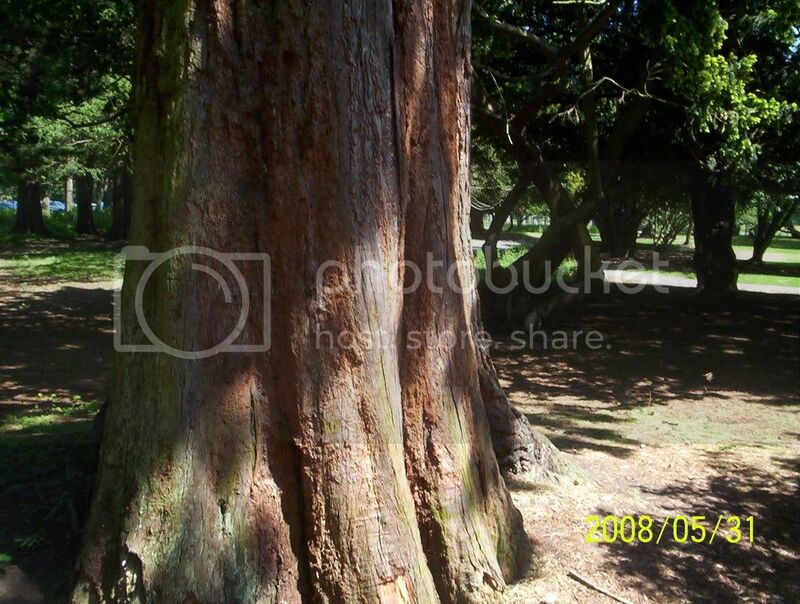 This can be due to caching, your pc remembering what the pic used to look like. Pressing F5 will usually clear that cache. 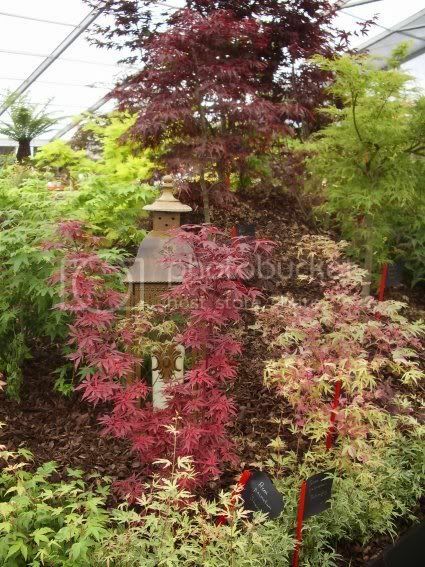 Great pics so far folks, getting a look at the show gardens and the show tents as well as the existing growing trees. How so, what direction is that as I have never gone the the house and home shows? I went on thursday and I found it great, puts my little plot to shame but looots of ideas. Did you go on one of the real swamped days such as Sat or Sun beolight? From what I heard of the crowds it was enough to put anybody off. i was disappointed too - two of us spent â‚¬49 just getting in, which is very steep, and some of the catering was stupidly expensive. it's basically a big garden centre, farmer's market and show garden rolled into one. we ended up buying one plant between us, as most the plants for sale are focused on what's in bloom now, unsurprisingly. 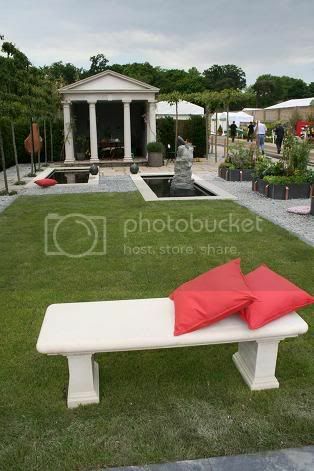 we were there last year, and i really liked it, but there's not enough new stuff on show to justify spending that much money; it'd be fine if you've got a blank canvas and want ideas, but if you have an established garden and don't need ideas, it loses a lot of its impact. thanks birdie for your comments ,happened by chance didnt notice people there when i took the photo. 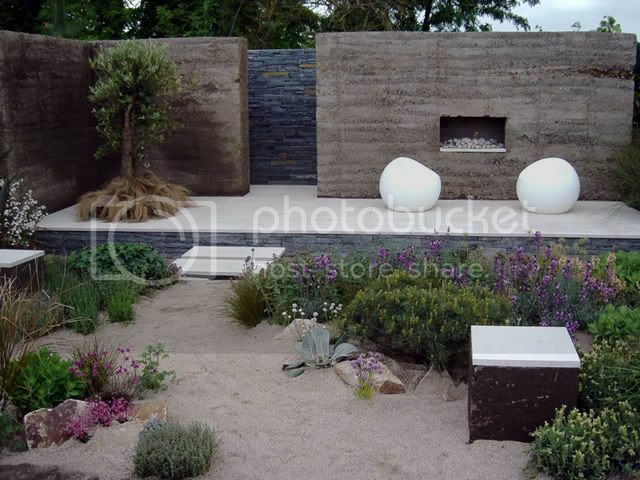 i would be hard pressed not to give this garden first prize .One question .How did they get the stones to look like that or are they concrete ?